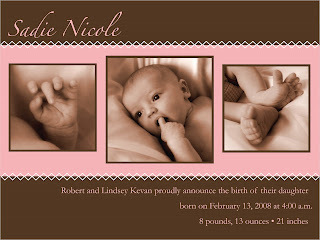 As a baby shower gift for my good friends Rob and Lindsey, I created these birth announcements for their new baby girl, Sadie. I worked mostly in Adobe InDesign, but created the branch graphic on the pink one in Illustrator. The photos used were taken by me, and Sadie was a great model. The poses she came up with at only two weeks old were amazing.